You are currently browsing the tag archive for the ‘Leith’ tag. 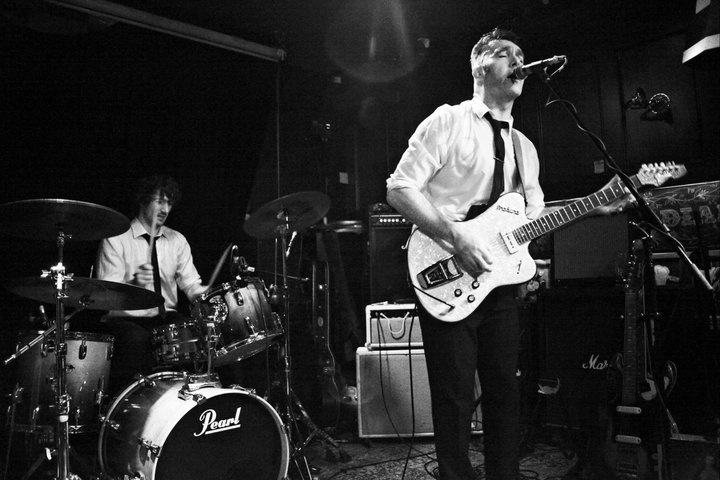 The Edinburgh Leith Rock and Roll club* is playing host to a triple header this evening with Belfast’s the Bonnevilles headlining; showcasing their hybrid brand of bluesy rock n’ roll. The speakers are balanced haphazardly on a couple of tables, the cheap booze is pouring and you can barely part the crowd to get tae the toilet so it seems like a pretty grand atmosphere**. First on the bill is Geek Maggot Bingo who were birthed from the ashes of well-known and well-appreciated The Acid Fascists***. Those in attendance are witness to a mash up of garage and surf punk dressed in the fashion of a disgruntled looking shaman on vocals and guitar who upon their exit song starts running into the mass of folk parting the crowd and who then precedes to kick the jams out amongst them. An early treat! Secondly, and the reason for many being in attendance, is the last show for Edinburgh stalwarts ‘The Seafield Foxes’ who batter through their set with jive and swagger treating those who have supported them throughout their tenure to everything they’ve come to expect. The band oozed with self-confidence throughout, this proved to be a grand finale that lived up to its name! And to the main event – the two gent’s Andrew McGibbon Jnr on guitar/vocals and Chris McMullan on drums dressed in their highly professional white shirt, black tie attire cascade through a mountain of tracks in their relatively short set time… and they are all immense. With said audience packed like a can of sardines and bouncing about, it doesn’t take long for shower of booze to rain upon everyone especially during ‘1000 days’ from the Bonnevilles most recent studio album ‘Folk Art & The Death Of Electric Jesus ’. From listening to their discography some may have been lulled into a false sense of relief as there is a dash of lower paced tracks to catch a breather with but no such relief was on offer tonight. As those slower paced numbers on the record are a different and generally more fearsome beast live, so the energy of the set and those dancing**** didn’t let up at any point. Things come to a close, the cheap booze is swiftly finished and everyone takes their wrecked bodies to the exit. When thinking of greaser Rock n’ Roll and the Delta Blues, my first thought would not be a couple of lads from Belfast. Well from the display tonight that may change from now on! *That would be the Leith Links Cricket Club by the way. ***Which is where I met my soon to be wife, so they were all good with me. ****If you can call it that?